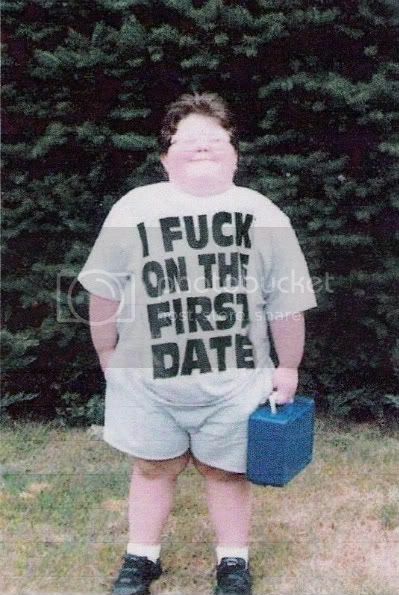 Well i have firsthand knowledge of a few things. You figure the Illegal immigrants are the reason or the governments scapegoats for the healthcare problems. I see companies that will do what they can to not offer health insurance. I see the unemployment rate and mismanagement of money as a bigger cause. Also, you're talking about closing borders, but do you realize a large percentage of these "illegals" are people that were brought here as kids with no say in their status. And that after 9/11 it became nearly impossible to fix the situation without being sent to a "foreign" land that is their birthplace but not their home?To me, a child raised here from an early age deserves rights, but they don't have any and they are constantly looked down upon and thrown in this criminal category. Many of these people have grown up and graduated college and can't work because of their status. You telling me they are straining our healtcare system? Ive resisted many extremely strong urges to interject in this thread...............and I still am. Just for sh*ts and giggles. The person who tries to enlighten and actually educate, simply presents simple, clear, irrefutable facts about the subject and leaves it for the person reading them to decide whether or not they want to accept them and proceed down this path of thought. No conclusions, or even suggestions of conclusions/reasons or whatever are drawn or suggested............and that way, you can actually tap into peoples intellect and leave it up to them to decided what they are willing to believe.............instead of trying to ram it down there throat and meeting endless resistance. In all my discussions/writings about 9/11...............I never once used the terms = "I think this because" or " They did this because they wanted too......"
Just present the facts and leave up to the person reading to decide whether they are ready for it..............thats why you keep getting so much negative reaction to your comments about these things Mig, and also why I wont join in with you (because I agree and have covered some of the same ground you have before)...........it just simply doesnt work and isnt my way. Wtf happened with my post?. Maybe I hit edit instead of reply???. Because I swear I was posting in reply of your pic, Bigs. bigstrads wrote: Ive resisted many extremely strong urges to interject in this thread...............and I still am. I agree with James here. The 9/11 stuff i'm ok with, i just don't buy this specific plan of the NWO to start population reduction in 2010 ( a specific year) and target 500 million ( specific number). I'm sorry those just seem to out there for me. The problem becomes generating a clear levelheaded investigation of the topic, where you can clearly separate what are facts (that most certainly are there) from fanatic delusion and presenting this to the unconvinced in a way where they have no choice but to accept what is truth. The more it is hyped as a grand conspiracy oooo aahhh, the more it will get tossed in with the Teabaggers and the Birthers crowd.. loonies. My question is... once you get a majority of the people believing these theories, then what? What are you going to do about it? Money and power have always held sway and will do whatever it wants. How are we going to change that? when I saw the events on tv on 9/11, I just shook my head and said "no way, I'm not buying it. Much too fishy, fishy. no fvckin way. the bastards are going to get away with this!!" These things don't just happen, they are allowed to happen. Very very............and unfortunately true Pat man. Thats the question I have asked myelf for many years.............most of the adult years of my life to be precise, and usually I ask myself it at the end of exhaustive search and collation of knowledge and facts. Thats problem though isnt it.............what would actually happen in these things could be become general public knowledge and opinion?...............can we trust humanity to revolt and try to make a better world? no, we cant. Also, that day, if it came and those who are revolting on a mass scale.............standing at the edge of the cliff...........can we really be sure that the f*cks that are being uncovered and fought against, wouldnt push that big red button in a vein attempt at silencing those who are trying to rid the world of them? Generally, people are too comfortable, too lazy, too stupid, too dis-connected and too downhearted (like us) to do anything about it. Thats modern living people..............we are in the age of disalusionment. TMC wrote: Wtf happened with my post?. Maybe I hit edit instead of reply???. Because I swear I was posting in reply of your pic, Bigs. Yeah...............man, I dont know what happened! thats weird huh.............you responded, at 10:13, to a comment I didnt even post until 10:24. Man, they are on to us!!! !............and it was with me posting about people having prior knowledge of things happening!!!!! Before TMC loses the very few marbles he has left trying to figure this out............Ill tell him that I posted that pic, then deleted to re-post with the rest of comment. I think Im turing dyslexic.........seriously, I re-read what I write and I sound like an Eastern European talking English! I think it starts with education... not of conspiracy theories.. but our overall education system. Real learning. Critical thought. They don't want an educated populace. They want an overworked dumbed down populace. Illuminate all the people then you will have at chance at true freedom, true democracy. You f*cker!!!. You owe me the three brain cells I wasted trying to solve this mess!!! RobDIKUM wrote: Well i have firsthand knowledge of a few things. You figure the Illegal immigrants are the reason or the governments scapegoats for the healthcare problems. I see companies that will do what they can to not offer health insurance. I see the unemployment rate and mismanagement of money as a bigger cause. I don't figure that illegal immigrants are the reason the U.S. health system is not good, that's what I've heard and read. You saying what you just said educates me on the subject a bit more. As for the companies shafting people with the health system, well again that's the government allowing all that, as they should have some control on that. As for those children/people that are considered illegal immigrants that have lived in the U.S. all their lives and still are considered illegal, well that's an issue in itself and really unfair, again, government should have fixed that. Those people, if they are willing to follow the rules that you and other U.S. citizens do and contribute to society, should have the same right as well. You are not trying to state that the picture shows that Alex Jones and anyone else that believes in it, is somehow liying or stretching the truth are you Bigs, because that picture shows another piece of evidence showing that the 911 disasters were setup, as you can see Building 7 is still standing and yet the reporter is claiming it just collapsed? Looks pretty somple to me, maybe you want to expand on it, unless you actually meant to show that the disasters were a setup. People want change for the better and want to know more than just what everyday life has. These topics, such as aliens and other conspiracy topics are now more discussed because people want to expand on the so called realm of possibility, and discover more. It is like humans are at the point of evolving a bit more and not content on just staying as they are and knowing the things they already know. Jack's_an_Ass wrote: My question is... once you get a majority of the people believing these theories, then what? What are you going to do about it? Money and power have always held sway and will do whatever it wants. How are we going to change that? The only way the NWO movement is stopped is if people get together and stop complying with the whole thing. That is not easy and you think to yourself, not comply with what. Really, it is not accepting these restrictions and removal of freedoms that are now happening, such as not having any say in what decisions are made in local councils and schools. Not accepting the presence of cameras in the streets, forced vaccinations and extreme manipulation to get people to give up some of their rights. When I listened to Alex Jones and watched his documentaries, it is really something how the U.S. constitution is absolutely not followed by the U.S. government. From disallowing gun ownership, to restriction of free speech, among many other things, it really is not that hidden. It comes down to people, most of society, getting together and standing united against the governments that are PAID by the people to serve them and yet are not doing so as they should. What the hell are you talking about Mig?.............see this is the other reason why I havnt joined in with alot of what youve been saying. Because you seem to talk in a way that makes it like your the only one whos thinking/researching these things.............when you know full well, and have seen numerous discussions/threads/posts of mine that have siimilar things to you.............but you act like Im some un-informed idiot. I remember when you first started this Alex Jones obsession, which came out of no-where really when considering you hadnt really voiced opinions like this before the last 8 months of so. The first time you started it, I made a simple comment against one little "theory" you had and you launched into me with the whole "Ohh you are blinded by main stream media and you just shut up and listen to what you goverment tells you!" My reaction was like = "What the f*ck, does he realise who hes talking too? (in the sense that I agree with most of what you were saying) does he not remember my 9/11 essays and various other political discussions that essentially said and covered all the stuff hes talking about now"
I was a little baffled and have just seen you carry it on. And with the pic up there.............a perfect example..............who could you possibly look at that and think that I wasnt posting it to highlight how they had prior knowledge of Building 7 coming down??? Or are you pissed off that you didnt post it and so you dont seem like the big man who's done all his homework? Ps: The ohter thing Ive noticed...........is that you seem to not really see/acknowledge what alot of people say anymore, especially about this things. I mean, lets forget about the picture comment up there because that is just insane that you would question my motives in posting it. Your comment under-neath, you talk about communication and all your trying to do stimulate communication and discussion, by speaking your mind. Thats fine, I didnt say you werent doing that..............my point was that the reason your not getting very far, or not getting very good reactions to it, is because your going too far. I mean, just post the facts and simple points of all this amazing and dedicated research youve done............why throw in "Ohh yeah, by 2012, the Food conglomerates are going to murder 500 million people"...............I mean for god's sake, what kind of reaction do you think you are going to get with that? Thats not dicsussion, thats not communication............thats barking a theory at people, one which you havnt backed up in any way with anything other assumptions. So if this "research" you do is so amazing and enlightning, then do me a favour.............show us specifically where you read/saw/heard the vital and conclusive information that lead you to the belief (so much so that you stated, very matter of factly, to us) that all these people are going to be wiped out? It all just seems very pubesent/I hate my Dad/I hate the World..............thats why I wont join in and support you, even though Ive covered alot of the same ground as you and even come to some of the same conclusions as you. 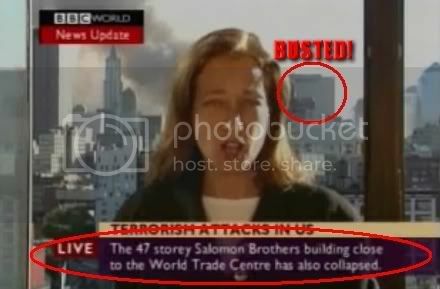 Look at the picture Mig................in the picture, theres a big red ring around Building 7, a big red ring around the statement that Building 7 has collapsed.............and the words "BUSTED" over Building 7 in the back-ground. LOl.............the way you phrased that up there = "because that picture shows ANOTHER piece of evidence showing 911 disasters were setup, as you can see Building 7 is still standing there and yet the reporter is claiming it just collapsed"
NO f*cking sh*t Sherlock..............I mean, I posted it thinking it was just a pretty picture of a BBC news feed...........I DIDNT EVEN NOTICE WHAT WAS HAPPENING IN THE PICTURE!!!!! Wow, Mig.............I cant believe YOU spotted that.............your amazing............the depth of perception you must have to spot, diseminate and then highlight to all us un-informed idiots.............just amazing. Must be all the research you do that enables you to look at that picture and figure it all out for us..........thank you Mig, thank you for opening our eyes. Do you see what I mean?.............why ask and then talk like that? to actually say, "well that picture ACTUALLY shows Building 7 still standing when blah blah blah".................I KNOW!!!! THATS WHY I POSTED IT!!!! Ohh man, why did I bother.............your just going to completely ignore everything Ive said and posted some reply that takes this off in an un-related tangent. Please just do me a favour and have a look at your respone to me posting that picture and the link.............because it displays exactly what Im trying to say to you. But hey, it makes for a good laugh so I'll give you that from an entertaining me for a few seconds point of view. From that, it looked like you were saying that people like me (and you refer to me obviously) get duped and believe things too quickly. That's why I posted that. We'll put it down to obviously not seeing what you wrote for what it was worth and getting very confused, which I admit, I obviously did. bigstrads wrote: Or are you pissed off that you didnt post it and so you dont seem like the big man who's done all his homework? That's just an too much ego statement man, an attempted low blow, which I admit, I'm not reacting to because I don't feel that way. Doesn't do you justice to say that. bigstrads wrote: Ps: The ohter thing Ive noticed...........is that you seem to not really see/acknowledge what alot of people say anymore, especially about this things. I don't think I've done that and you'll have to explain to me how I have. I admit I have some passion on these subjects, but I don't think I've done that with anyone. bigstrads wrote: Your comment under-neath, you talk about communication and all your trying to do stimulate communication and discussion, by speaking your mind. Maybe I am going too far with some of the information I state. Maybe it is too much for some people. I will keep saying things though, as maybe some people will look some things up. I don't shy away just for fear of people thinking less of me. As for not getting good reactions, I think the reactions have been good and more people have gotten involved in these discussions. Not too many, but some. bigstrads wrote: I mean, just post the facts and simple points of all this amazing and dedicated research youve done............why throw in "Ohh yeah, by 2012, the Food conglomerates are going to murder 500 million people"...............I mean for god's sake, what kind of reaction do you think you are going to get with that? I will soon post a shiit load of links to information that I have presented. That's really something I was too lazy to do and I should have. bigstrads wrote: It all just seems very pubesent/I hate my Dad/I hate the World..............thats why I wont join in and support you, even though Ive covered alot of the same ground as you and even come to some of the same conclusions as you.